↑ S. Sacks, Kenneth (1976). "Herodotus and the Dating of the Battle of Thermopylae". The Classical Quarterly. 26 (2): 232–248. สืบค้นเมื่อ 2008-07-05. ↑ Bury, J. B. (2000). A History of Greece to the Death of Alexander the Great (4th Revised Edition ed.). Palgrave Macmillan. pp. page 271. Unknown parameter |month= ignored (help); Unknown parameter |coauthors= ignored (|author= suggested) (help)CS1 maint: Extra text (link) The 1913 edition (same page numbers) สามารถดาวน์โหลดได้ที่ Google Books, . ↑ Bury (1913), page 295. Bradford, Ernle (2004). Thermopylae: The Battle for the West. Da Capo Press. ISBN 0-306-81360-2. Cartledge, Paul (2006). Thermopylae: The Battle That Changed the World. Woodstock, New York: The Overlook Press. ISBN 1-58567-566-0. Matthews, Rupert (2006). 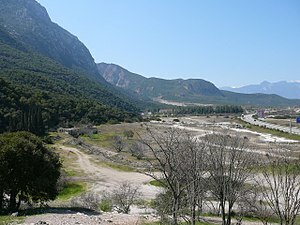 The Battle of Thermopylae: A Campaign in Context. Stroud, Gloucestershire, UK: Tempus Publishing. ISBN 1-86227-325-1. Ctesias; Freese, J.H. (Translator) (2002), "Persica", in Photius; Pearse, Roger, Bibliotheca (Myriobiblon): Codex LXXII, The Tertullian Project . EDSITEment staff. "300 Spartans at the Battle of Thermopylae: Herodotus' Real History". National Endowment for the Humanities. สืบค้นเมื่อ 2007-12-18. Stecchini, Livio C. (2007). "The Persian Wars: the Size of the Persian Army" (html). Iran Chamber Society. สืบค้นเมื่อ 2007-10-19. The Five Great Battles of Antiquity by David L. Smith, Symposion Lectures, 30 June 2006. หน้านี้แก้ไขล่าสุดเมื่อวันที่ 23 กันยายน 2560 เวลา 04:06 น.